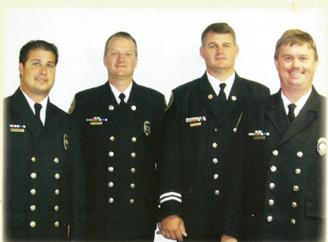 In the early morning hours of February 25, 2010, a fire occurred in a two-story, 6-plex in the city of Menomonie. The apartment building is student housing for the University of Wisconsin, Stout. Within minutes of the call, firefighters arrived to find heavy black smoke coming out of the front of the building. As the first arriving firefighters pulled hoselines to attack the growing fire they were told by two of the residents from one of the apartments that their roommate was still inside. These same residents just moments earlier were alerted to the fire and were able to rescue themselves. But now precious minutes have passed and the conditions inside the building were growing worse and their roommate had not been seen outside. Pipeman Pete Terry and Larry Zais from Engine 6 were on the nozzle moving into the front door. The smoke was pushing from below, the fire burning somewhere in the basement. They were told that the missing woman was upstairs, where the conditions were growing worse by the second. Knowing that searching with the hoseline would slow their efforts, they handed the line to another crew and then ascended the stairs to search for the victim. Within minutes, they found the woman, Elizabeth, semi-conscious, lying on the floor. Together they carried her downstairs and outside where her immediate medical needs were cared for by firefighters from Engine 2. The Engine 2 crew then transported Elizabeth to Red Cedar Medical Center where she was treated for her injuries. Firefighters Pete Terry and Larry Zais put themselves in a perilous position by searching without their hoseline, but the trust that their fellow firefighters would handle the fire while they went above it gave them the window of opportunity they needed. This gallant effort and exceptional dedication to duty in the highest tradition of firefighting resulted in a precious life saved. 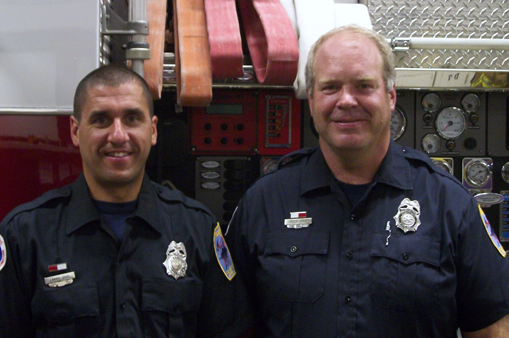 In the early morning hours of December 29, 2007, the Appleton Fire Department was dispatched to a structure fire in an older, wooden duplex. The crews answering the call for help first had to navigate through the icy city streets, which were covered in freshly fallen snow. The original message given to the firefighters was that everyone was out of the house, but when crews arrived, they were met by a woman who was frantically pleading with them to get to her four young children who were still inside the home. The woman, Tricia Dunster, had just been rescued from the basement of her burning home by her upstairs neighbors who had pulled her out of the house through a broken basement window. Now bleeding from being cut by broken glass, she tried to get to her children, but the smoke and heat prevented this mother’s greatest efforts to get in and recue them. Driver/Engineer Doug Vrechek and Firefighter Mike Becker were at the front door, tasked with entering the house to search for the children. With visibility near zero and the unchecked fire burning below them, Vrecheck and Becker made their way inside and found the front bedroom, where two of the four children, Kailey and Aailiyah were sleeping. Lieutenant Mike Woodzicka and Captain Frederick James were also making their way into the house to search for the trapped children. They went into the dark, untenable house, where they found another bedroom, where, fortunately, the 15-month-old twins, Brayden and Brycen were found. Each of these four firefighters now held a young child in their arms and they quickly carried them outside where they then attended to their medical needs. After treatment at the hospital for their injuries, the four young children and their mother were all released and went on to recover from this life-threatening ordeal.